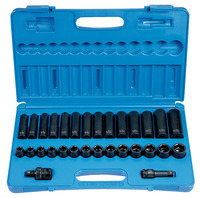 Grey Pneumatic 1/2 in Drive Standard and Deep Length Metric Master Impact Socket Set includes a 1/2 in x 1/2 in universal joint, a 3 in extension and 30 pieces of 6-point sockets sized from 10 mm - 24 mm in both standard as well as deep lengths. The 14 pieces of metric deep length sockets feature sizes such as 10 mm, 11 mm, 12 mm, 13 mm, 14 mm, 15 mm, 16 mm, 17 mm, 18 mm, 19 mm, 20 mm, 21 mm, 22 mm and 24 mm. 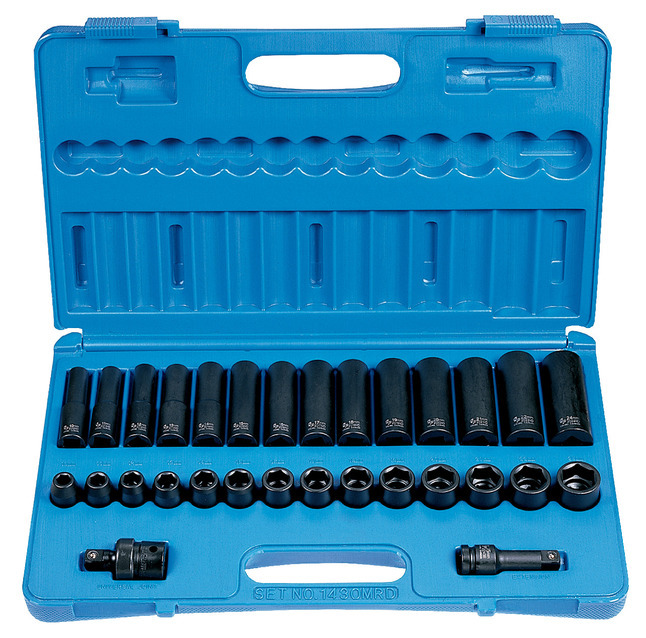 The 14 pieces of metric standard length sockets feature sizes such as 10 mm, 11 mm, 12 mm, 13 mm, 14 mm, 15 mm, 16 mm, 17 mm, 18 mm, 19 mm, 20 mm, 21 mm, 22 mm and 24 mm.